For years researchers have tried to detect dark matter and failed and this past year was no exception. Dark matter is made of elusive particles that supposedly make up approximately 27% of all matter and over five times the amount of normal matter in the known universe. The concept of dark matter came about almost fifty years ago when astronomers discovered that the stars and gas in the galaxies they observed all rotated around their galactic centers at pretty much equal velocities regardless of their distance from the centers. This is contrary to what was predicted for galaxies that were supposedly dominated by gravity concentrated in their centers. In this prediction, the rotation speeds of the material in these galaxies should decrease with distance from the centers of the galaxies. It was therefore assumed that it was the gravitational influence of some sort of invisible and interspersed matter that was binding all of this material together and causing the flat rotation curves of the galaxies. Decades have been spent searching for this mysterious “dark” matter using several different techniques and instruments. This past year several dark matter experiments concluded without any of them finding even a single particle. The aptly named XENON dark matter research experiments attempt to detect scintillation and ionization in liquid xenon caused by collisions with weakly interacting massive particles (WIMPs) within the xenon. WIMPs are one of two types of particles researchers think could make up dark matter. XENON100 was the second phase of the experiments and utilized a detector containing 165 kilograms of liquid xenon located under 1,400 meters of rock at the underground Laboratori Nazionali del Gran Sasso in central Italy. Researchers reported in September last year that after a combination of 477 days of live operation between January 2010 and January 2014 they detected no dark matter collisions. 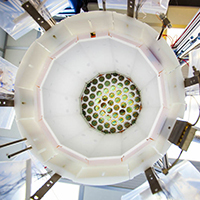 Despite this another even larger detector, XENON1T was built and began operation in March of this year. XENON1T utilizes 3,500 kilograms of liquid xenon held in a 10 meter tall water jacketed tank. PandaX is a liquid xenon detector located at the China Jin-Ping underground Laboratory (CJPL) in the Sichuan province of south-west China. The CJPL is the world’s deepest underground laboratory at more than 2,400 meters (1.5 miles) below ground. 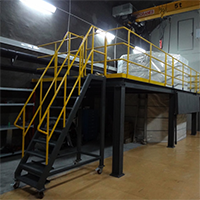 The laboratory’s depth and location under marble rock makes it the world’s best shielded from muons with a flux rate a hundred times lower than the Gran Sasso laboratory. 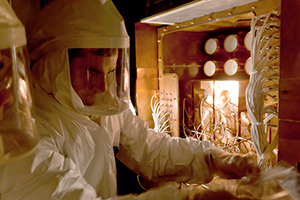 As with all liquid xenon detectors, PandaX is used to try to detect WIMPs that interact with the refrigerated and circulated noble gas. Weighing in at 500 kilograms it was the largest detector of its kind at the time of its operation. However, the project leader reported in July that after an exposure of 33,000 kg-day of liquid xenon no trace of dark matter was observed. Despite these lack of results, PandaX-III begin construction this year and a 20+ ton PandaX-IV is planned for 2020 through 2025. Another aptly named dark matter research project is the Large Underground Xenon (LUX) experiment, yet another liquid xenon detector featuring a time-projection chamber (TCP) like XENON and PandaX. This detector contains 370 kilograms of liquid xenon and is located 1,510 meters (.93 miles) below ground in the Sanford Underground Research Facility (SURF) in the former Homestake Mine in the Black Hills of South Dakota, United States. Researchers reported in July that after a 20-month (332 live days) run from October 2014 to May 2016 they had detected no trace of a dark matter particle. And just as with the other aforementioned liquid xenon detector-based experiments, despite its failure to detect a single dark matter particle, a bigger and more sensitive instrument is being planned. The 7-ton LUX-ZEPLIN (LZ) experiment is under construction and planned to be operational by the year 2020. 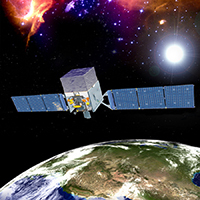 Researchers from the University of Amsterdam’s (UvA) GRAPPA Center of Excellence analyzed over six years of gamma-ray background fluctuation data gathered by the Fermi Large Area Telescope between August 2008 and May 2015. The Large Area Telescope (LAT) is the main instrument of the Fermi Gamma Ray Space Telescope spacecraft. The LAT is an imaging high-energy gamma-ray telescope that scans the entire sky every three hours. The Fermi spacecraft was launched into a near-earth orbit on June 11, 2008 and is operated by the National Aeronautics and Space Administration (NASA). The researchers published their results in December of last year. In their paper they describe two different classes of sources that contribute to gamma-ray background fluctuations, but no traces of a contribution of dark matter particles were found in their analysis. 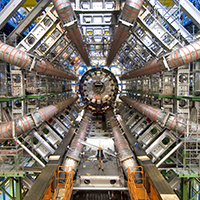 In December of 2015 the two teams operating the A Toroidal LHC ApparatuS (ATLAS) and Compact Muon Solenoid (CMS) particle detectors on the Large Hadron Collider (LHC) both reported they had detected excessive pairs of high energy photons (gamma rays) being released during a proton collision experiment. It was speculated that not only could this be an indication of a new elementary particle, it could perhaps be the discovery of dark matter. But this past year on August 5th at the International Conference on High Energy Physics (ICHEP) representatives from ATLAS and CMS reported that after collecting and analyzing nearly five times as much data this year as they did last year they had come to the conclusion that the “diphoton bump” was nothing more than a statistical fluctuation. Of course many scientists still remain optimistic that one day the LHC will finally detect dark matter particles. It is this kind of blind optimism that has contributed to what appears to be an endless search for what is essentially a mathematical construct. Not all scientists are convinced that dark matter exists but many of their alternative theories can be just as esoteric, involving Modified Newtonian Dynamics (MOND) or extra dimensions or quantum field topology defects. Unfortunately very few scientists are willing to consider the simplest explanation for why normal matter in galaxies does not behave the way gravity dictates it should: gravity is not the dominate force in the universe. Over 99.999% of all the matter in the universe is plasma and plasmas can generate magnetic fields. Many mainstream scientists argue that astrophysical plasmas are overall electrically neutral and therefore have very little influence on surrounding matter. However, considering that the electromagnetic force is 1039 (or one duodecillion) times stronger than the force of gravity, even if only one quadrillionth of the plasma in galaxies contains a net charge it could still exert an overall potential force a trillion trillion times stronger than gravity. Such a force can explain why all the stars and most other material in galaxies rotate around their galactic centers together as though suspended in some sort of unseen matter. In fact a electromagnetically dominated universe can explain many things observed in astronomy and astrophysics, such as the redshifts of stars and galaxies, the lensing of light around galaxies and galactic clusters, and even the existence of the cosmic microwave background (CMB). But scientists have a lot of time and money invested in the belief in a gravity dominated universe. And understandably none are eager to admit that they are wrong or need to change the path of their research that some have spent their entire careers pursuing. So, as noted above, they will continue to build bigger, deeper and more sensitive machines through this year and beyond. Many of these experiments are under tremendous pressure to eventually produce results, particularly those that receive public funding. Because of this pressure many of these experiment failures are already being played off as successful eliminations of dark matter candidates. But eventually researchers are going to run out of candidates, so I am making a prediction for 2017 based on what happened shortly after I posted my summary of failed gravitational wave experiments at the end of 2015. I predict that sometime this year one or more of the dark matter research teams is going to resort to claiming an unknown signal spike or a statistical anomaly or perhaps even a noise pattern match as the first actual direct observation of dark matter…and finally get away with it. It has already been attempted by the research team for the DAMA/LIBRA (Dark Matter Large Sodium Iodide Bulk for Rare Processes) experiment also located with XENON at the Laboratori Nazionali del Gran Sasso in Italy. Since 1998 they have claimed that an annual signal spike in their detector is dark matter being detected as a result of the Earth’s movement through our galaxy’s halo of dark matter. 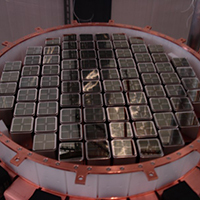 As the name implies, the DAMA/LIBRA experiment attempts to detect scintillation and ionization in sodium iodide crystals instead of liquid xenon. While there is no doubt an annual signal is being observed, no other dark matter detector can substantiate this signal. So it is assumed to be generated by some other source than dark matter despite the continued claims of the research team. But it is my hope that not only the researchers themselves but also the public, who frequently helps fund these experiments, will continue to scrutinize their results, not only in 2017 but throughout the years to come. Perhaps one day we will come to celebrate a New Year where astronomy and cosmology is based on fact and reason, rather than fear and dogma. 2 comments on "2016: The year of the missing dark matter"
Almost anything that comes from the physics and astronomy community is to be taken with a large grain of salt. This includes dark matter, gravitational waves, black holes, wormholes, time travel, spacetime, time dimension, the speed of gravity, etc. It’s all BS. The second paper, “a tale of two physics”, shows Kepler’s curve modified for a finite speed of gravity. The stars line up on the new predicted (modified) Kepler curve. Big Physics should absolutely be on the defensive after this. This the more comprehensive or readable paper is on skysthelimit.com along with supporting papers, yours included. Your LIGO rebuttals are important as that seems to be one of the last threads that non-baryonic dark matter hangs on. Hopefully this predictive math can help to expose the physics echo chamber.